Fresh can be synonymous with minimalist. Having a clean house with minimal yet fully functional furnishings and appliances go a long way. Not only do these collectively look amazing but they also take away the stress you get when you have to constantly tidy things up at home because of all the stuff you have inside. 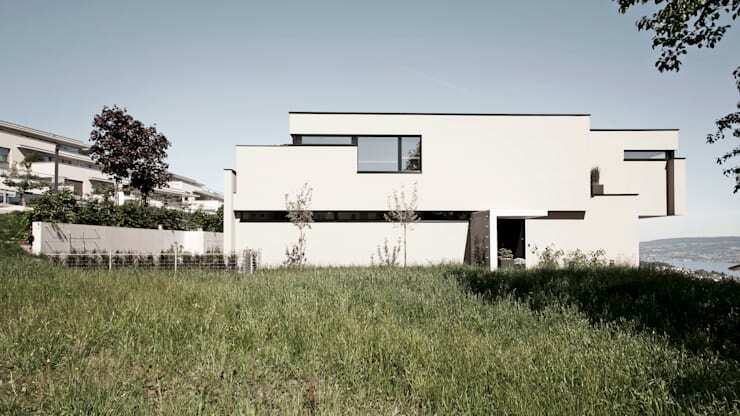 So, to refresh you, have an eye-opening tour of this house built by Swiss architects from Meier Architekten. If you could make a statement out of your home without being too flamboyant, it would be going geometric, big, and in white like this house. It fashions an intricate maze for its exterior with the windows appearing and shaped in the most unconventional manner for a building. 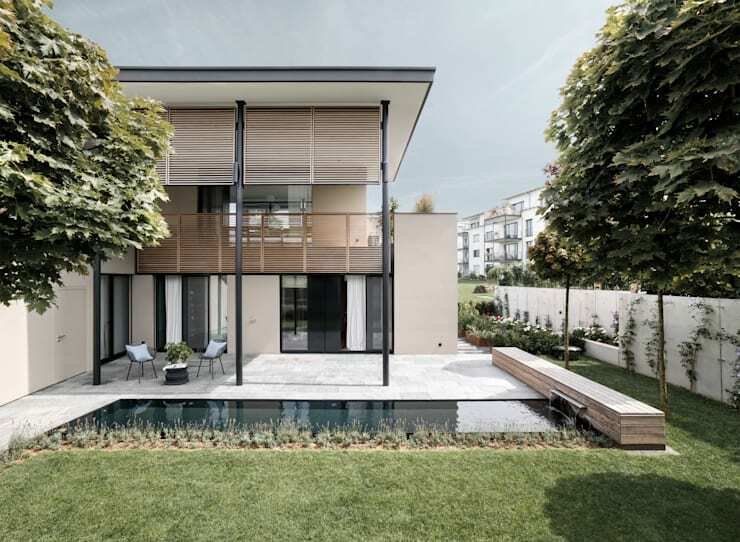 In any case, it completely pulls off a balanced design including the areas where the structure occupies and where it doesn't. On one side of the house is the pool area that's rather peaceful because of the help of lesser fancy designs but more attention to utility and solitude. We're talking about the presence of the high roofed pool side, the wooden railings and blinds on the balcony overlooking the pool. Here's another perspective of the area which notably has a lap-designed pool. The roof over the pool side is also flat-styled and it literally projects from the main building. 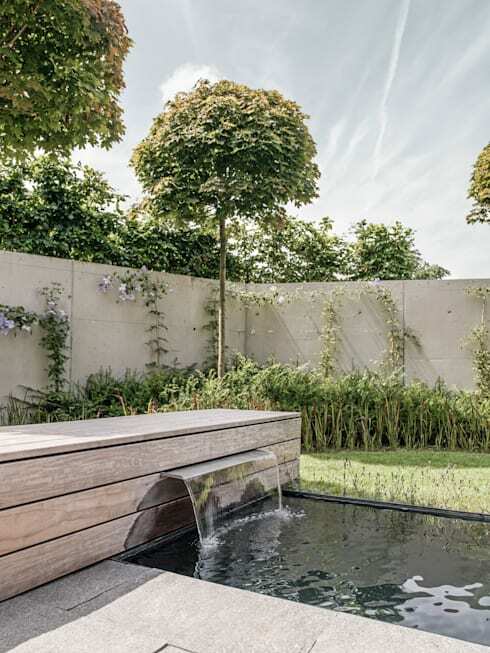 If you haven't noticed earlier, the pool is adorned by a small fountain which flows water through a sleek wooden case. The brown color of case somehow ties the steel blue to gray of the pool with the green of the plants. Isn't this just instagrammable? The living room is absolutely stunning with its encompassing windows that give off a spectacular view of the outdoors. You have nothing more than neutral toned furniture pieces here but they just manage to look effortlessly sophisticated. The low shelf lining the sides are also brilliantly serve as additional sitting areas with a view! The dining area is composed of gray to brown elements with a modern flair. Never forgetting that too much monochrome can equate to boring, the interior designers had the dining table graced by a classy light fixture. Notice also the light brown tone of the walls and the small windows lining the corner. 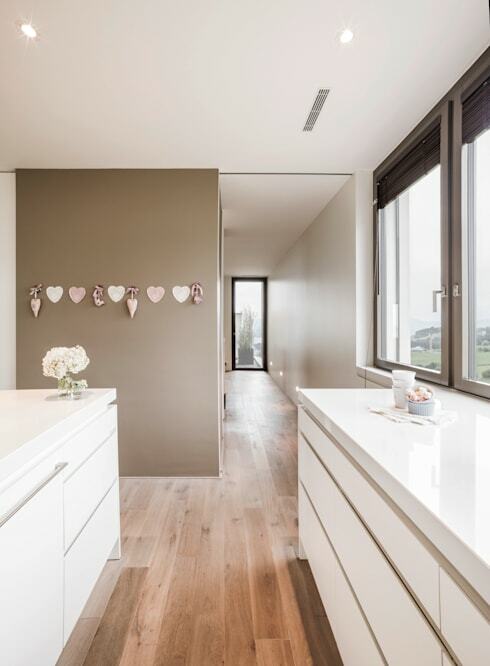 Fashioning white and wood for the floor, the kitchen mesmerizes with its spaciousness and brightness thanks to the help of the surrounding wide windows which can be tempered by the blinds. 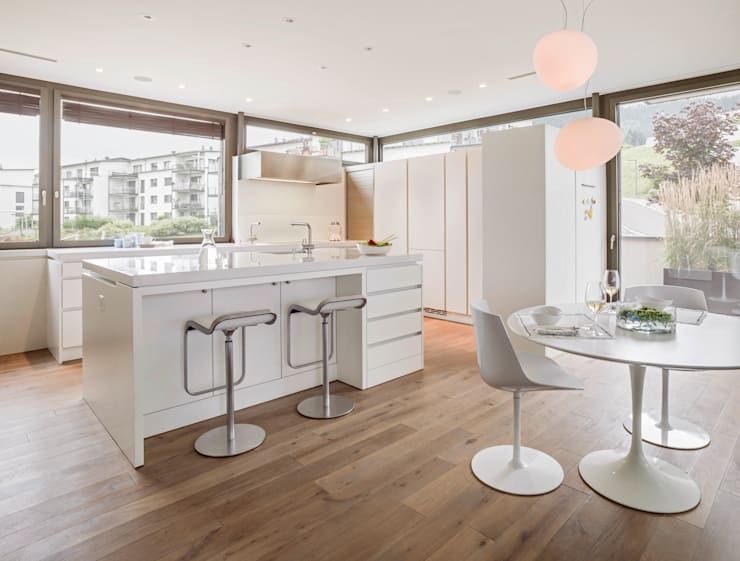 Other than that, there's an island counter with stools paired to it for easy cooking and entertainment. The area is also equipped with a retro-styled breakfast nook. 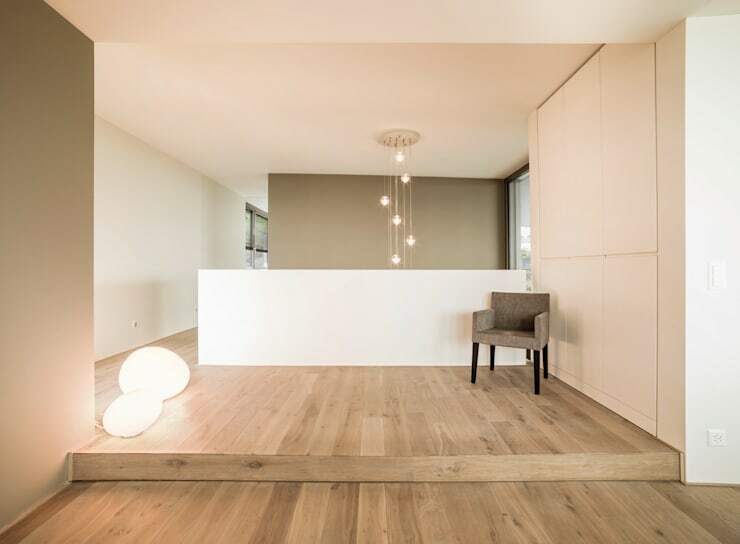 Nothing probably says balance than this space right here that's got the neutral colors complemented by white, the wooden floor emphasized by the plain-coated surfaces plus the subtle dramatic effect played by the lights and the single cozy chair by the corner. The bathrooms in this house have their own quirks. 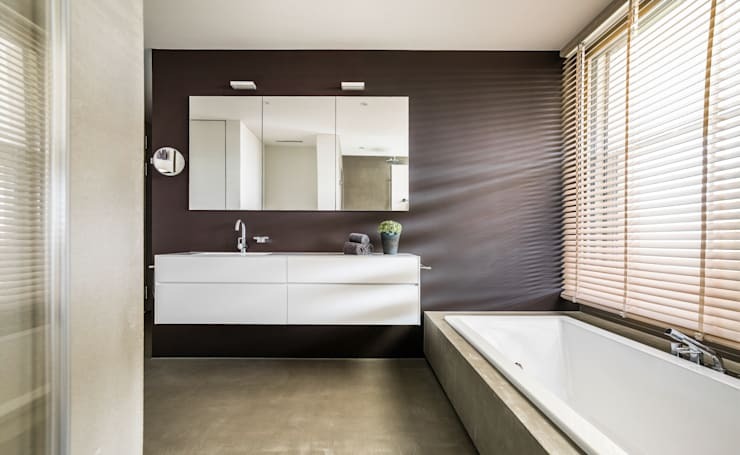 This one continues the minimalist theme but innovates a bit by adding an industrialist flair to it through the use of smooth concrete surfaces and the subtly charcoal palette. This is just an alternate view of the same bathroom. The sink and counter is visibly wide, so is the mirror. 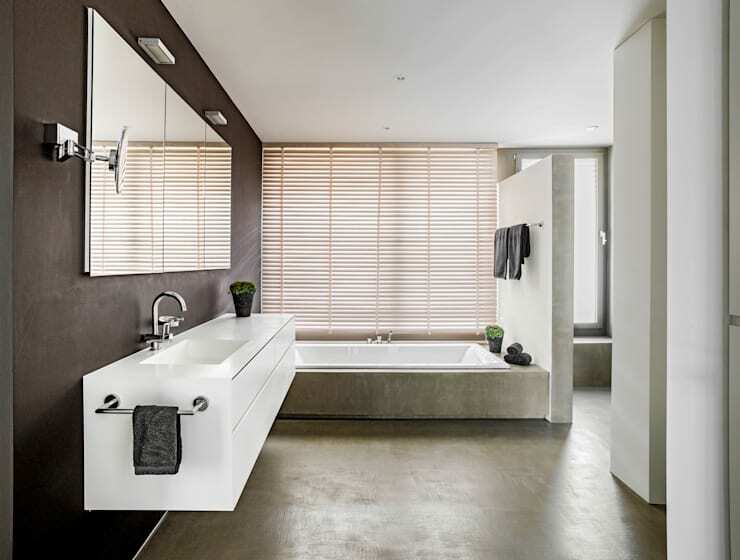 In fact, the low tub is also long so you can most likely feel that the designers wanted to elongate this already spacious bathroom. Of course, that shouldn't be a problem because these only serve to keep you refreshingly cleansed. 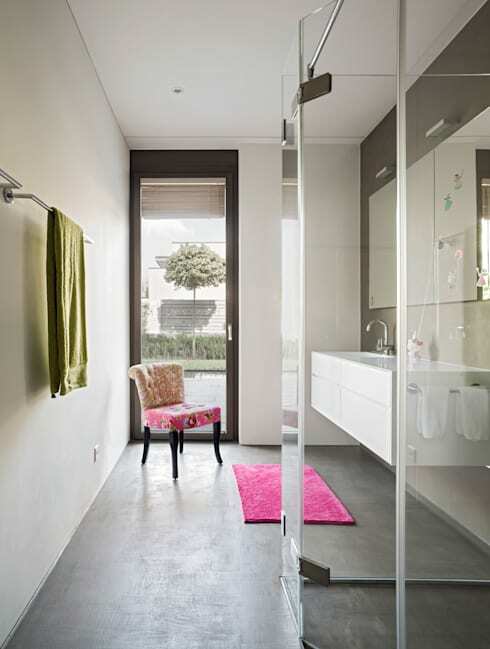 Girls can also choose this effeminate bathroom that still fashions the modern and minimalist styles in spite of the pink upholstered vanity chair and rug. There are two girl's bedrooms to choose from. One is this lavender-painted room and the other is just a plain white (seen below). In both, you will find the same smooth wooden flooring and attention to lesser furnishings and ornmaments, with the exception of a few colors to keep things interesting for the young ladies. For our final stop, we're featuring the playful and lovely details stuck on the pale greenish brown wall by the kitchen. Notice how these decorations still coincide with the general appearance of the house. They're neutral colored which is mostly why they don't compete with the elements inside. 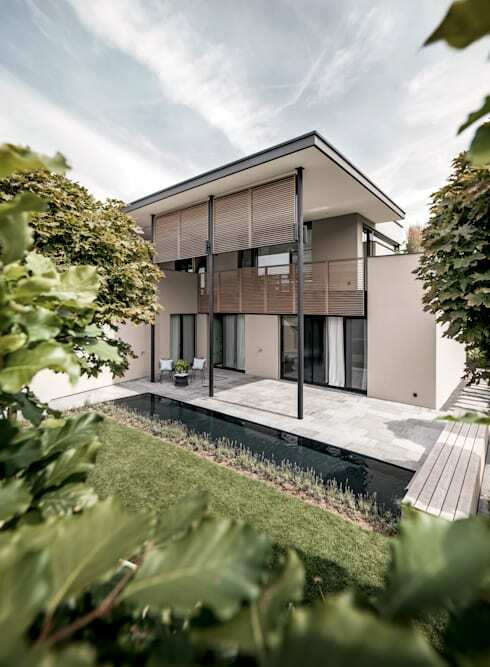 For more visual feast, check out this family home with an incredible attention to detail.